PORT JERVIS—CEO of Ellicott Development Co., William Paladino, brought good news and not so good news to the Port Jervis Common Council meeting on April 11. 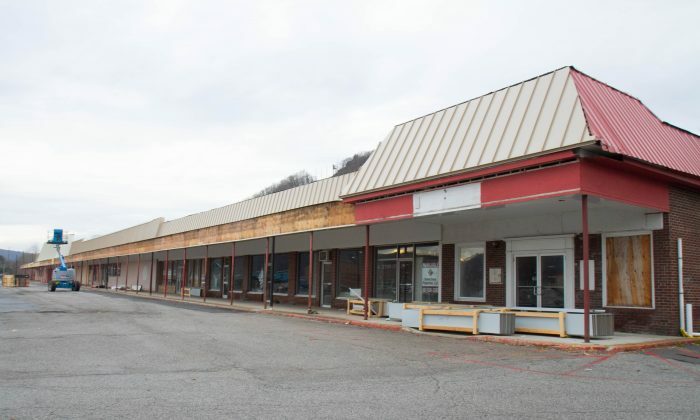 The good news is that work has restarted on the Pike Plaza strip mall, which Buffalo-based Ellicott owns, but the tenants that they were hoping to have secured by now have not yet signed contracts. This was in part because there were delays getting the building materials so they couldn’t set a definitive move-in date. Since last week, the strip mall has shown some noticeable changes, which Ellicott hopes will help pull in some on-the-fence prospects who have only seen the shabby, partially finished exterior so far. Part of the new façade is up, the soffits (the underside of the overhang) are almost finished, and the roof is close to being finished, Paladino said. Project Manager Tim O’Brien estimated most of what was started last week will be finished by the end of this week, and the rest of the exterior by the end of May. Paladino said about 10,000–15,000 of the roughly 80,000 square foot strip mall has businesses with “definitive interest” in it, and now that work has started again and they have a more concrete idea when the tenants could move in, he hopes to have contracts signed by the end of May with some businesses moved in by the end of the year. Those businesses, Paladino said, include restaurants, small shops, a bank and some “other service-type providers.” He said they are looking at national retailers, as well as regional, and local businesses to fill the Plaza. The end of the plaza closest to the Erie turntable has over 42,000 square feet that could, and has traditionally, served an anchor tenant. Ideally they would like to keep the existing nine store fronts the way they are to save money, but haven’t ruled out expanding or subdividing the strip mall if need be, including that more than 42,000 space at the end. So far the focus has been on getting a grocery store as the anchor tenant because Paladino said that is what they thought people wanted, and what has been there before. But with all the competition in the area—Shoprite in Montague, Save-A-Lot in Port Jervis, and Price Chopper in Matamoras—and the high taxes in New York, they are having a hard time finding one. “A lot of tenancies that we would usually go after and talk to already are in close proximity in other states,” Paladino said. When asked about specific businesses, he said they had already talked to Wegmans and Aldi, which were not interested, and they currently are talking to Big Lots. Ellicott has commissioned a study of the grocery store competition in the area up to a 15-mile radius, Paladino said, which would provide the hard data that some of the grocery stores they are talking to need to make their decision. And depending on the results of the study, he said, they may stop pursuing a grocery store entirely. A lot of tenancies that we would usually go after and talk to already are in close proximity in other states. — William Paladino, CEO, Ellicott Development Co.
“We’re not sold on a grocery store. We’re going to get the best tenants we can get to occupy the plaza,” he said. Second ward councilman Robert Ritchie reiterated his idea to bring in a store that dovetails with the outdoor recreation opportunities the city is developing, opportunities that would draw people from outside Port Jervis. He said this may be a draw to retailers who were looking only at Port Jervis’ demographics. Paladino said that is something he brings up to potential tenants and would be open to having such a business in the plaza if it made sense. O’Brien came before the Industrial Development Agency (IDA) in January to give an update on the plaza since the IDA has an agreement to waive the property taxes while it is in development. At that meeting, he said they hoped to have some contracts signed by the end of May with businesses moving in by summer. In an October interview with Epoch Times, Paladino said they hoped to have the exterior work done by November with the plaza up and running by spring of this year. Second ward councilman George Belcher said in their defense they faced a lot of unexpected problems that set the project both back time-wise and financially. Almost 65,000 square feet of metal decking in the roof had to be replaced, which O’Brien said looked liked a “kaleidoscope” in some places it was so full of holes. They also had to deal with burglaries, asbestos abatement, and prolonged negotiations with the building department on the building’s colors. “You can never foresee it all,” Paladino said. He said that every site has its pros and cons, but especially when dealing with a pre-existing building, like this one, which has been vacant since they bought it in 2012, there are going to be problems. The plaza came through a foreclosure sale, Paladino said, and the reason they bought it in the first place is because Rite Aid was interested in staying in that location and asked Ellicott to buy it. The color palette both Ellicott and the building department agreed on are “neutral” colors, said O’Brien, that match the exterior of Royal Furniture, Burger King, and Rite Aid. The façade is going to be off-white and beige while the front will be painted to match the red brick sides. The currently bare metal poles will be wrapped with “thicker, denser, square columns,” Paladino said, and will also be a beige color, according to drawings of the exterior presented at the council meeting. The doors and some of the exterior may change depending on the aesthetic requirements of the new tenants. The parking lot will be repaved with new lines drawn for the parking spaces so that the light poles are not in the middle of the drive aisles. “I really don’t understand the method or the means of why they did it the way it is done,” O’Brien said about the current parking layout. They hope to tear down the 4-foot fence between the municipal lot on Pike Street and the plaza parking lot because “it’s a 4-foot fence that collects garbage,” O’Brien said. Mayor Kelly Decker said he did not know whose fence it was, but would bring it up at the next council meeting. He said he thought the council would be in favor of removing it because it will “enhance” the farmers market that is moving into the park next to the Plaza.